— Kelley Wolfe, Asheville, NC. — Adele Steele, Atlanta, GA.
— Katherine Caldwell, Mars Hill, NC. I feel very thankful to have resources such as Vishnu Dass and the Blue Lotus Ayurveda Clinic. Vishnu Dass is not only a caring and concerned health practitioner, but I consider him a master of the science and art of Ayurvedic healing. He is a great listener and I have benefitted a lot from his counsel. The Blue Lotus Ayurveda is a wonderful place to receive treatments. The staff caters to all of your needs. It has a peaceful, healthful, and loving environment. I would go much more often if I lived in the Asheville area, but it is well worth the trip. I wish everyone could experience the bliss therapy! “After an entire winter of illness with one flu after another and seven trips to doctors my immune system was exhausted and my MD saying, ‘It’s tough when no one can figure out what’s wrong with you.’ In my first appointment at Blue Lotus Ayurveda Vishnu Dass said, ‘I know exactly what’s wrong with you and how to fix it.’ One week later I felt better than I had in months and cruised through the next year’s flu season unscathed. Vishnu has a deep understanding of Ayurvedic Medicine and I have found his treatment to be the most holistic I’ve ever experienced, truly focused on bringing body, mind and soul into harmonious balance. He is an inspiring, enthusiastic and knowledgeable teacher who walks the talk of an ayurvedic lifestyle. “I first came to Blue Lotus Ayurveda desperate, very desperate, for healing. I had tried many things over the past several years to get to the root cause of why I had become sick with “fibromyalgia,” nerve pain, memory problems and brain fog, depression, digestive issues, allergies to everything, skin rashes, and various other symptoms… During my first consultation, Vishnu seemed extremely knowledgeable and thorough as he so patiently listened to my complaints and history, even though my situation seemed so complex. I had an instinctual feeling I was in the right place with the right people. — Christina Judd, Atlanta, GA.
— Sheila P. Wenzel, Jamestown, NC. — Andrea Stolz, RN, Asheville, NC. — Beverly Moore, yoga teacher, Tryon, NC. — Brian O’Grady, yoga instructor, Mars Hills, NC. — Shannel Vaughn, Asheville, NC. — Trini Sampson, Johnson City, TN. 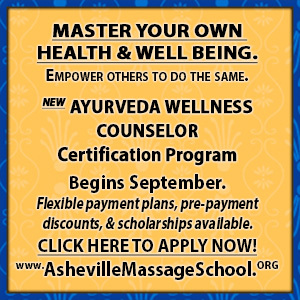 “I come to Asheville from Atlanta at least once a year for Panchakarma, and usually arrive burned out and so ready for the week of cleansing/detoxifying, relaxing, comforting treatments and care – and food fixed by Vishnu. The personalized treatment plan addresses every level of whatever is out of balance at the time, and I leave restored, rejuvenated and very appreciative of the deep results of the week’s work. Vishnu has worked with my Atlanta doctors’ plans and concerns. If I had just done as Vishnu has prescribed for nutrition and lifestyle, based on my Ayurvedic “type”, I wouldn’t need any other doctors! The relationship personally and professionally is one that makes you feel the that you are a real part of this family that is blessed with and shares their warmth, wisdom, humor, and sincerity. “Vishnu Dass is very knowledgeable in the realm of Ayurveda. He teaches with enthusiasm and a sense of humor, making an adventure of the study of this vast and complicated system. — Rosemary Lackey, Asheville, NC. — Kachina Davine, Asheville, NC. — Rachael Giesenschlag, herbalist, Asheville, NC. — Eric Hartford, Asheville, NC. — Patrick McCormick, musician and student of herbalism, Asheville, NC. — Shelly Johnson, artist, Asheville, NC. “I’m here to testify that my experience studying at Blue Lotus was pure delight. Vishnu’s teaching style, curriculum, and intimate setting contributed to profound learning for me. The weekly schedule, with occasional weekend outings/workshops, kept me engaged with the subject and my fellow classmates. — Suzanne Gordon, Seattle, WA. — Dawn Crowley, RN, Asheville, NC. A personalized healthcare plan using and in-depth constitutional assessment. Authentic herbal medicine and practical dietary and lifestyle recommendations. In person or phone.